The Walmart Black Friday Ad 2012 has been released online. Don’t forget to sign up to receive all of the Black Friday Ads as they are leaked. Walmart is having 3 different Black Friday Sales this year, The first sale starts at 8 p.m. on Thanksgiving Day, the second sale starts at 10 p.m. on Thanksgiving Day and the final sale starts at 5 a.m. on Friday Morning. 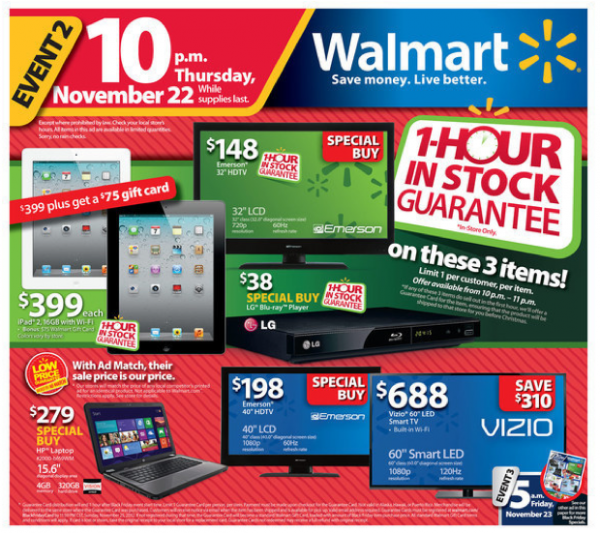 Thursday Door Busters Starting at 8 p.m.
Thursday Door Busters Starting at 10 p.m.
Friday Door Busters Starting at 5 a.m.
View the Full Walmart Black Friday Ad here. Looking for more? Read more posts about Black Friday Ads 2012 & Black Friday Deals 2012 & Walmart Deals. I am so sad the stores are open and having these sales on Thanksgiving Day! I guess more people than I thought were out last year shopping on Thanksgiving, encouraging the stores to make these decisions. I agree, Shari. As much as I love a deal I am not prepared to give up my family for one. I appreciate the MSM site sooo much but I am ignoring all the Black Friday stuff. In my opinion, Black Friday has become a huge ‘black cloud’ over this country. I want my Thanksgiving to be spent in thanksgiving! So sad for the employees and store owners too. A few weeks ago I was at a shoe store in the mall. The only employee in the store had just gotten off the telephone with her husband. She looked upset, so I inquired as to why. She told me her store had to be open Thanksgiving and all night through black Friday, of course that would effect her family’s celebration. She was frustrated because shoppers aren’t “shoe shopping” at these crazy hours. She told me the mall fined her several hundred dollars for every hour her store was not open. I just found out yesterday that my daughter will be working Thanksgiving as well for these very reasons. Seriously, for the folks who do work retail wouldn’t it make sense to give them one last day off to spend with family before the busy Christmas season starts?? Maybe this isn’t a big deal for a lot of people but I am in tears as I type this. When will the madness stop? Why has getting a deal become more important than spending time with family on a holiday? I am also saddened to read that stores are valuing profits over family. I was appalled when stores began opening at midnight. A few years ago, I broke down and went Black Friday shopping with a large group of family members who venture out yearly. We had a great time. NOT because of great deals but by spending time together. I predicted that it would begin earlier and earlier due to stores trying to outdo each other. I had no idea it would be this soon and that early-8:00! How sad that some will give up their day of thanks gathered with family over saving a dollar or two. Even sadder yet, those who have no choice.